Paint Out Norwich launched in 2014 and since then well over 120 different artists have taken part in our dozen professional competitions and over 150 in our 8 public paint outs. Our first satellite painting event was Wells-next-the Sea 2015 on the North Norfolk coast. That year also saw first-of-its-kind mass public ‘paint outs’ firstly on Wells Beach at sunrise and then, the following month, of some 100 artists, of all ages, painting the expansive Norwich skyline, from historic Mousehold Heath. 2017 saw our first pop-up at a festival at the Royal Norfolk Show. 2018 saw first events at Sudbury, Suffolk and Great Yarmouth, Norfolk. 2018 was our fifth year and twelfth Paint Out competition event, not to mention 8 public paint outs. 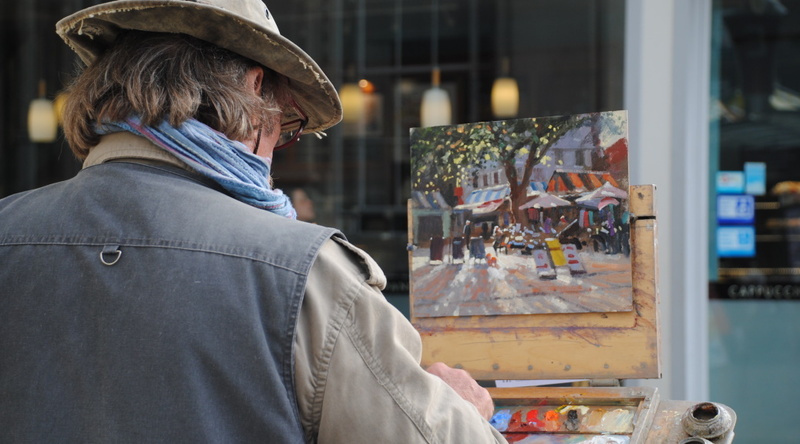 Paint Out Norwich 2018 plein air painting days during the Hostry Festival 2018 ran 13-16th October (a weekend-only option was also available) with a public ‘paintout‘ on Sunday 21st, and a Private View, Awards & Art sale on 17th October. This was followed by an art exhibition of over 150 paintings (from 300 created) until 28th October at the Norwich Cathedral Hostry. Applications were juried by our selector David Curtis ROI RSMA.. View the 2017 winners or 2016 gallery online. Paint Out Norwich 2017 launched the year with a day of art workshops in perspective drawing, tonal oil painting, and social media skills . The following day saw a full day public ‘paintout‘ around The Market and St Peter’s Street from an open-top double-decker bus! View the prize winners from PON 2017. Our 2016 art exhibition is now over but paintings are being added for view, and a few still for sale, to our online gallery. Over 150 artworks from 34 artists aged 26-75, some of whom – including a mother and daughter pair – took to Pub and Paddle‘s canoes to paint from the waterline of the River Wensum, discovering new and old views of the city alike. Sue Mann, renowned for painting from a bicycle, won this year’s Spirit of Plein Air Award for being the first to take the plunge and paint from a canoe. This year we innovated again by running a ‘Freestyle‘ larger form, 2-day, event alongside our classic Core event of 4 separate 3-hour painting sessions. Our groundbreaking Nocturne event returned for its second year with an increased number of submissions. The new Freestyle event was won by Robert Nelmes for his widescale painting, “Norwich Market”, and the runner-up second prize went to Brian Korteling for his very urban Magdalen Street flyover, complete with graffiti, “Waiting for the bus”. This prize category was sponsored by La Ronde Wright. The returning Nocturne event was won by Tom Cringle for his “Untitled” spire at night, with Michael Richardson‘s “Night Time in the Lanes”, coming second. This prize category was sponsored by Sowerbys. The Core event was won in Mixed Media by Alfie Carpenter, with runner up Tom Cringle – who also won Second Prize overall, sponsored by La Ronde Wright, lifting his prize total to £500. In Watercolour, Richard Bond‘s “Between the Showers” won, with second place going to Andrew Horrod. The Oils category saw second place go to Roger Dellar, and first place to Chris Daynes for “Yelow Canoe” which also won the overall First Prize and a £1000 in total including his category win, sponsored by Strutt & Parker. 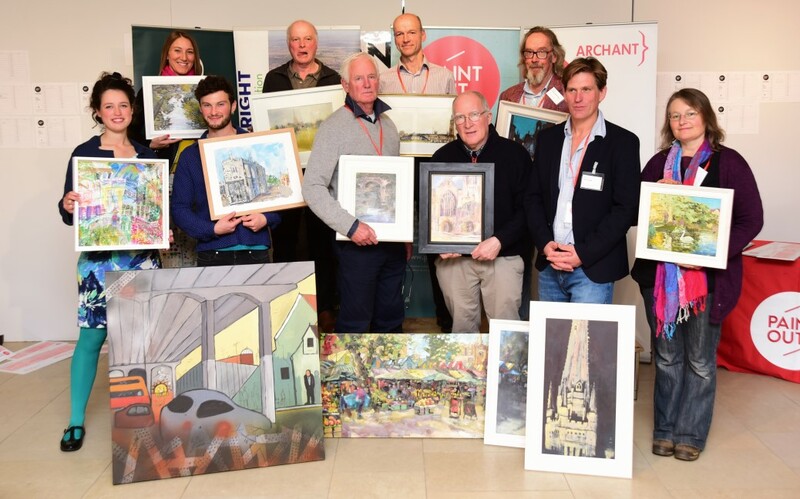 We are also grateful to Archant for sponsoring several second placed prizes as well as the Watercolour and Mixed Media categories. The Paint Out Norwich 2016 competition, with multiple categories, saw 17 prizes in total, old and new locations, and continues to provide artistic challenges and opportunities for both seasoned plein air professionals and aspiring amateur artists. Over 180 artists registered an interest this year, with over 40 being accepted into the third-year of Paint Out Norwich. 33 took part, producing 140+ paintings in the exhibition. October 19th-23rd 2015 saw the selection of 40 artists working in a variety of mediums to create work in response to Norwich’s vibrant cityscape during a timed competition in full view of the public. This year, the enlarged pool of artists, painted over 3 days and nights, to include daytime and nocturne painting, a mass “paint out” from Mousehold Heath with around 100 artists overlooking Norwich, youth/student entry prizes, and new location options. Register interest in our 2017 competition. The 2015 Prize Winners were Richard Bond (1st), Mo Teeuw (2nd), Eloise O’Hare (3rd), Michael Richardson (Nocturne 1st) with judges commendations to Brian Korteling, Gennadiy Ivanov, Liam Wales, additional prizes including the ‘Spirit of Plein Air’ award to Alex Egan. 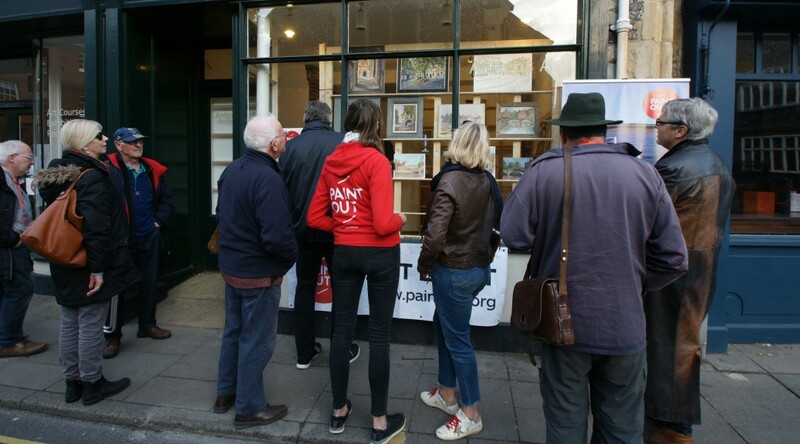 Paint Out Norwich displayed the art work of 40 artists at a Gala Private View and Art Auction on Friday 23 October 2015 and from 24 October through to December the art is on view at various exhibition venues around Norwich including the Hostry, Maddermarket Theatre and OPEN. Some 28 jury-selected artists were chosen from nearly 60 entries for the inaugural Paint Out Norwich event. 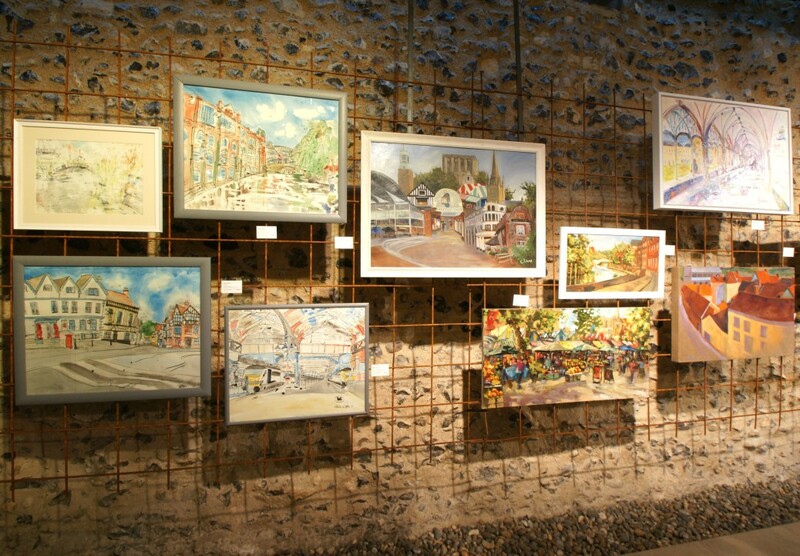 The artists were in action on 22 and 23 October 2014 at seven iconic Norwich locations. The judges of the event were Trevor Chamberlain, Amanda Geitner, and Colin Self. The event was won by Haidee-Jo Summers, Chris Daynes, and Roy Connelly. There was an art auction and then a two-week painting exhibition.